Minneapolis continues its golden run of producing quality talent with the first project to arrive out of the Gayngs collective, the super slick electronic pop-soul outfit Poliça. Fronted by vocalist Channy Leanagh who sang with Gayngs, produced by Ryan Olson and featuring Mike Noyce from Bon Iver, it’s a who’s who of the current Twin Cities scene. After collaborating in the studio and live with Gayngs in 2010, it became apparent that Channy and Ryan should form a group of their own. The result is eleven perfectly formed auto-tuned songs that reshape the intersection of pop and R&B. And for all Poliça’s synthetic manipulation, Channy’s soft vocals and Ryan’s electronic soundscapes reveal a tender heart beneath, pulsating with life and raw emotion. The name Poliça refers to the word ‘policy,' meaning a definite course of action adopted for the sake of expediency, suggesting they were formed out of necessity. 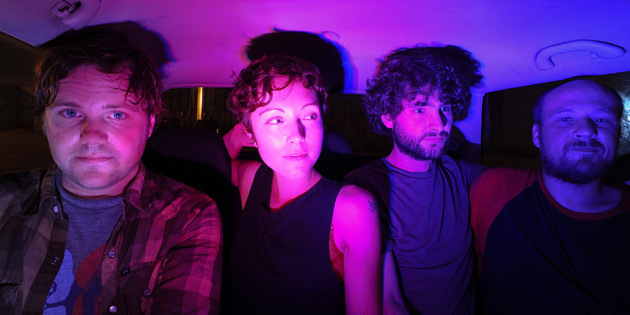 Which is exactly how this music feels and sounds; urgent, original and genre-defying, Poliça are absolutely essential in 2012. Check out our Jam of the Day, "Lay Your Cards Out," below and pick up their debut LP, Give You The Ghost, right here.